Now this is where I was just a year or two ago. Not that I thought I knew the answers to everything, but that there were things that I was utterly convinced I knew. And how did I ‘know’ these things? But believe me, I knew I was right. I knew that I could judge an outstanding/good/requires improvement lesson. I knew, at the point of learning, that my pupils were learning. I knew that this or that teaching practice, in which I’d invested lots of time and effort, was effective. Except I found out that none of that was actually true. I thought I knew the answers, but I’ve since learned that I was way off. I didn’t know the answers. I’ve since been challenged on what I thought I knew and really, they were just beliefs. Beliefs that were also left wanting when held up to the unforgiving light. The problem is that, in thinking I knew the answers, I told other people those answers too. I’ve led groups on the monolith that is SOLO taxonomy. I’ve taught on ITT courses about new technologies. I’ve been both kingmaker and heartbreaker in dispensing judgements when observing lessons. Being challenged on what I think I know has made my approach to teaching much more discerning. But the important step I’ve had to take was to embrace my own ignorance. To not allow myself to think that I know the answers, or to assume that the answers I have are right. Where does this belief that we know the answers come from, if often those answers are wrong? Frequently, when challenged on why we ‘know’ something, the response isn’t based in evidence, rather in a sense of intuition: we just know. 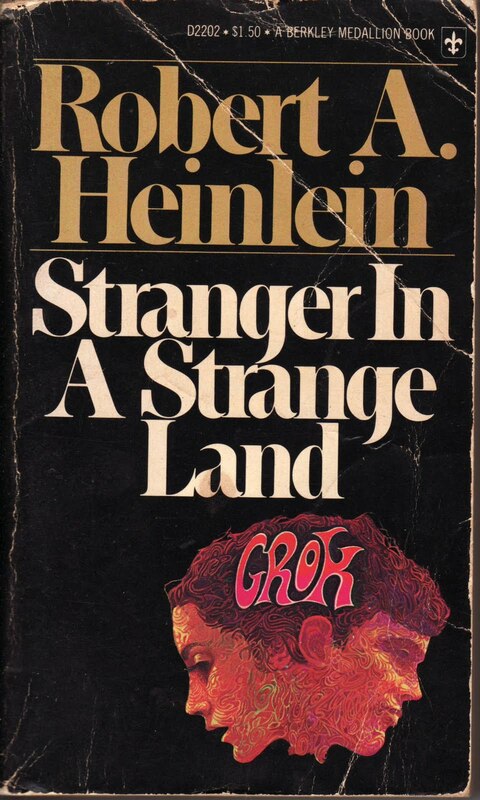 As Heinlein points out, the ability to grok – to absolutely know intuitively – is actually beyond Earthlings’ capabilities, it is a faculty particular to the Martian race. Now I know that in the eyes of most pupils, teachers are an alien race. This is particularly evident if we are spotted in Tesco on a Saturday morning (point, stare, whisper, probe). 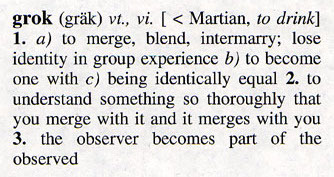 But I think the belief that we, like Heinlein’s Martians, intuitively grok – we understand unconsciously – is prevalent in schools. And it worries me as to the extent in which grokking informs what we do. I think it pervades a lot of practice in schools. It certainly has informed a lot of my practice in the past. What is important is that we always detach ourselves from what we think and consider why we think it. 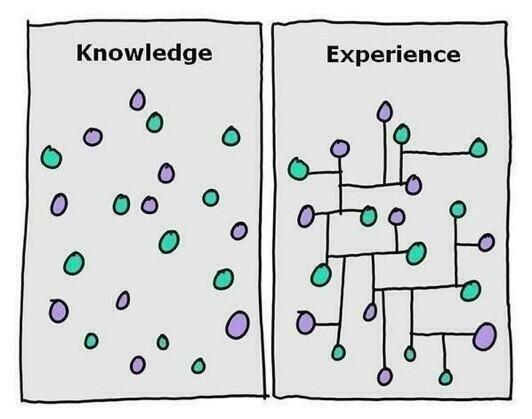 We should challenge our own assumptions, rigorously, and embrace our own ignorance. It’s okay not to know the answers. As Steven Levitt says, thinking that we do means that we’ll “never learn anything”. Truthiness. the American Dialect Society named it Word of the Year in 2005 (beating podcast and sudoku along the way), and dictionary publisher Meriam-Webster followed suit in 2006. But, in the circles I move in, it is a word that is as rare as a workless Sunday. Which is strange given that I move in education circles a fair amount: the word seems more than a cosy fit in so many of the experiences and conversations I’ve had. 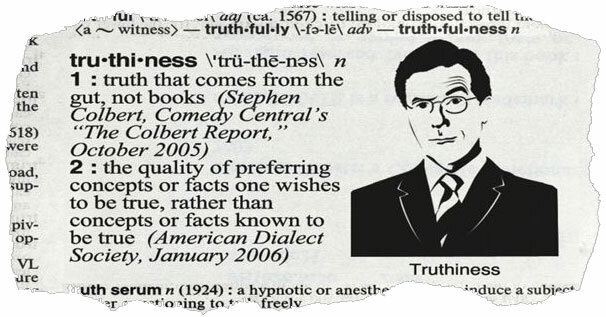 The word ‘truthiness’ was coined (or rather: “a word I pulled right out of my keister”) by the American satirist Stephen Colbert in the pilot episode of his popular daily show The Colbert Report in 2005. It is variously defined as: ‘the quality of seeming or being felt to be true, even if not necessarily true’; ‘the quality of seeming to be true according to one’s intuition, opinion or perception without regard to logic, factual evidence, or the like’; and ‘the quality of being considered to be true because of what the believer wishes or feels, regardless of the facts’. You get the idea. Colbert himself used the words, “truth that comes from the gut, not books” in his mocking condemnation of the cult of truthiness in politics. 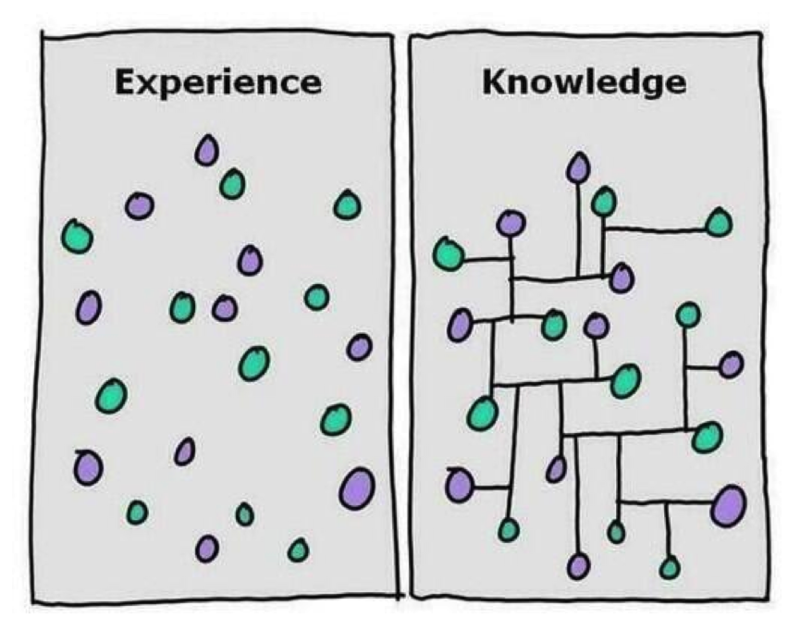 Our world of education is littered with such truthiness. Pithy, seemingly aphoristic sayings or rhetorical turns are tossed across social networks daily and retweeted with revelatory agreement. Just yesterday, two such soundbites made their way into my timeline. The thing about them is that, unthinkingly, they look and sound like truth. But if you take a second to question them, all you are left with is truthiness. But I think this is open to discussion. My point is that the original graphic doesn’t represent truth, only truthiness. The problem is with these things is that the more they are repeated and retweeted, the more they seem to be believed and held up as truths (see: the daft exams/animals climbing a tree cartoon). There is a Chinese proverb that goes: ‘Three men make a tiger’. This comes from a story in which a king is being asked by an aide if he would believe a citizen’s report that he’d seen a tiger roaming the markets. The king said no, of course he wouldn’t. The aide then asked what if two people reported they’d seen a tiger in the busy markets and the king said he’d begin to wonder. When asked his reaction if three people reported seeing the tiger, the king said he would believe it. The aide then said that the notion of a tiger in a crowded market is absurd and that the king would believe something so absurd just because it was repeated often enough. Three men make a tiger. So when we repeat these things so heavily reliant on truthiness, they seem to slip effortlessly into truth for many of us. 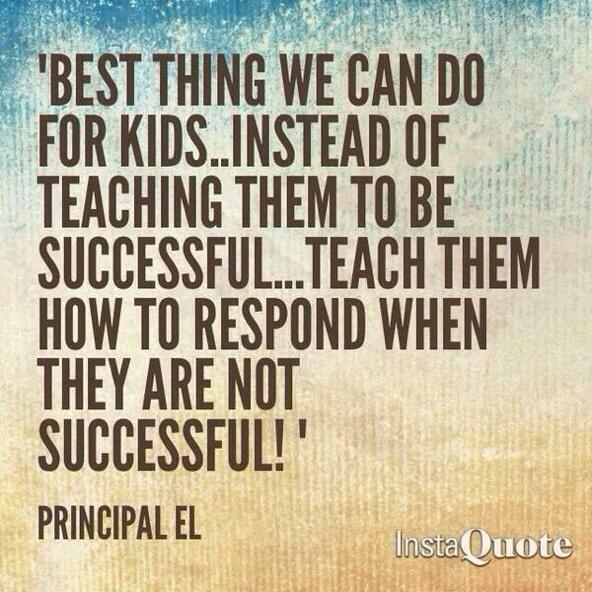 I mean, it is very sensible to teach pupils how to respond when they are not successful, of course. I think there is a lot to be taught in schools with regards to failure. But of the two things, wouldn’t teaching people to be successful be better? If that is the dichotomy on offer (and it seems it is set up as either/or), surely the first option is more valuable? Even the inevitability of ‘when’ in the latter statement is a little defeatist, isn’t it? Again, this is up for discussion. But the fervent agreement with which this was retweeted masked the truthiness of it all with an accepted truth. A truth that really isn’t solid. It is really important that we all take a cautious, critical approach in order to spot the truthiness in these pithy factoids. Believe me, the truthiness is out there. It’s bloody everywhere. 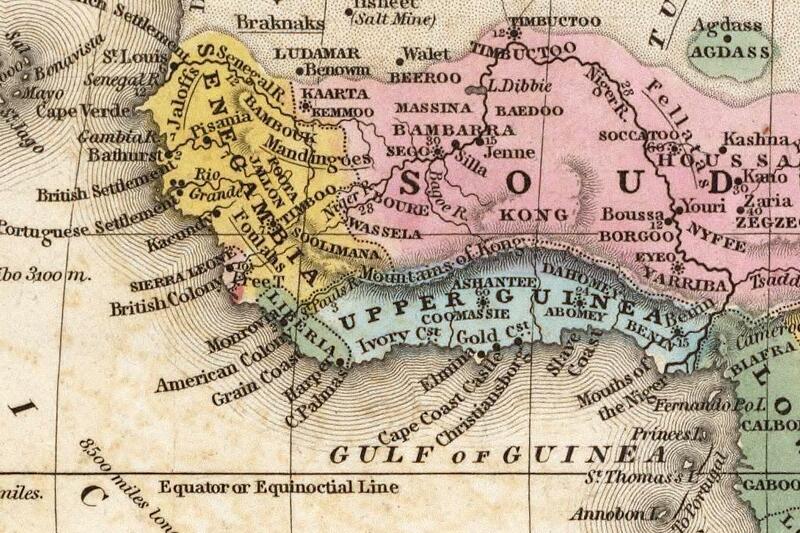 A map of West Africa from 1839. The map on the left looks unexceptional to me, a layman. It’s a standard, if rather archaic, map of West Africa. But geographers are a lot sharper than most of us, with the kind of keen eye that can spot a child trying to pick up something very unpleasant on a wet beach at a distance of 100 yards. Through drizzle. And those geographers would probably be able to tell you that the mountain range that runs along the north border of Upper Guinea doesn’t actually exist. It never has. 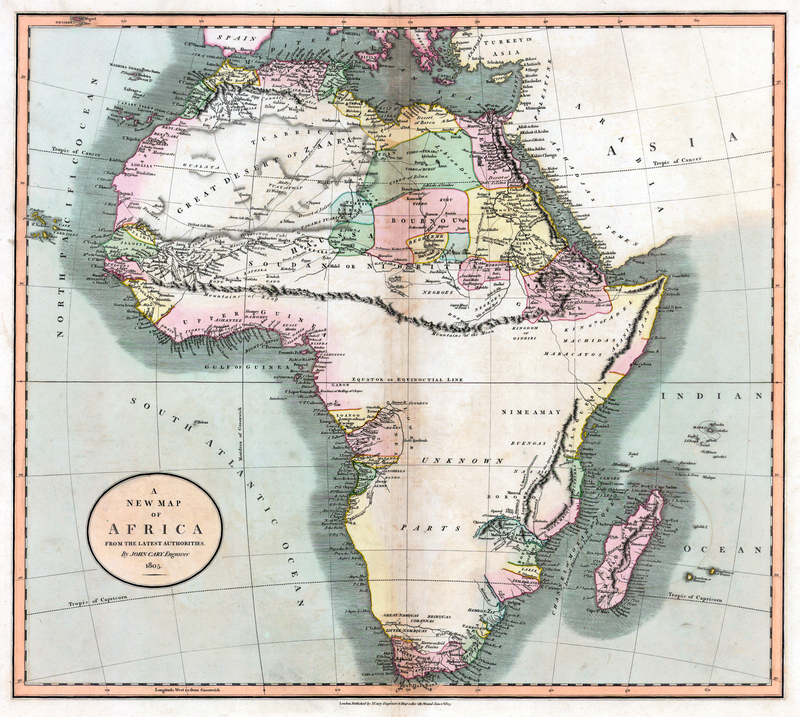 You see, this map was created by the cartographer James Rennell to accompany the Scottish explorer Mungo Park’s travelogue, Travels in the Interior Districts of Africa (1798). Park was trying to find the source of the Niger river and was curious as to why it didn’t flow south of the Gulf of New Guinea. He saw a few mountains and assumed that this was the reason why. Rennell believed this theory and, wanting to show ‘proof’ of it, he forged on his map an entire (and entirely fictional) range of mountains that ran from West to East Africa: The Mountains of Kong. Following Rennell’s map, other maps began to include the Mountains of Kong. In fact, for almost 100 years nearly all of the maps we had of Africa contained this feature. Nobody checked to see if these mountains were really there. Indeed, explorers actually avoided the area because the mountains were stated to be of “stupendous height” and were considered an “insuperable barrier”, making them impassable. Other cartographers just added more lies when reproducing maps: one added snow and another connected them to the Mountains of the Moon in Central Africa, they themselves being another entirely non-existent range invented in the ancient world. It wasn’t until the French explorer Louis Gustave Binger went on an expedition to chart the Niger between 1887-1889 that this lie was uncovered. Binger effectively undiscovered a mountain range. Whilst most cartographers stopped including the Mountains of Kong on their maps henceforth, they did still pop up now and again: they were indexed in 1928’s Bartholomew’s Oxford Advanced World Atlas and they even appeared in the 19th edition of Goode’s World Atlas as recently as 1995. The reason that these mythological mountains prevailed in print for so long is down to the belief that cartographers are ‘guided by an ethic of accuracy’. When I heard this story I was struck by how analogous it is with education, particularly with regards to initial teacher training. There are lots of edu-myths paraded around in these early stages of our careers, and they find disciples due to the belief that educators are guided by the same ethic of accuracy as people believed of 18th and 19th century cartographers. But the truth is that some of what we learn has little or no provenance of any discerning and plenty of it is based on the whim of people aiming to make money out of schools. I faithfully followed many of these myths myself, and would still be doing so if it weren’t for the emergent wave of bloggers and academics engaging teachers with research via social media. My approach and practice has certainly been sharpened because of this. But not only have I noticed a change in my approach, I am also seeing a great deal more trainee teachers coming into schools with a critical, questioning and discerning mind; new teachers who are clearly actively engaging with research via social media and blogging. Whilst it took me a few years to undiscover education’s Mountains of Kong, there are loads of bright, new teachers who are questioning their existence from the very beginning. I wish I’d been so switched on at that stage of my career. Today is the eve of another of Tom Bennett‘s prized researchED conferences, David Weston‘s National Teacher Enquiry Network is working with some great schools on research projects, and the Education Endowment Foundation is a great source for research and is developing an evidence base for school and classroom practice. There’s a great deal of research available to teachers now. I’d encourage everyone to explore it. My recent project has been to reduce my displays from being crutches upon which pupils were relying, to being the sites of memory cues for things that they should know. Previously I’ve used all sorts of displays, full of poetic and rhetorical devices, sentence structures and examples of uses of punctuation. I found that pupils were not committing these things to long term memory and solely relying on what was written on the classroom walls. Clearly, this doesn’t help them when they write elsewhere, most obviously in the exam hall. 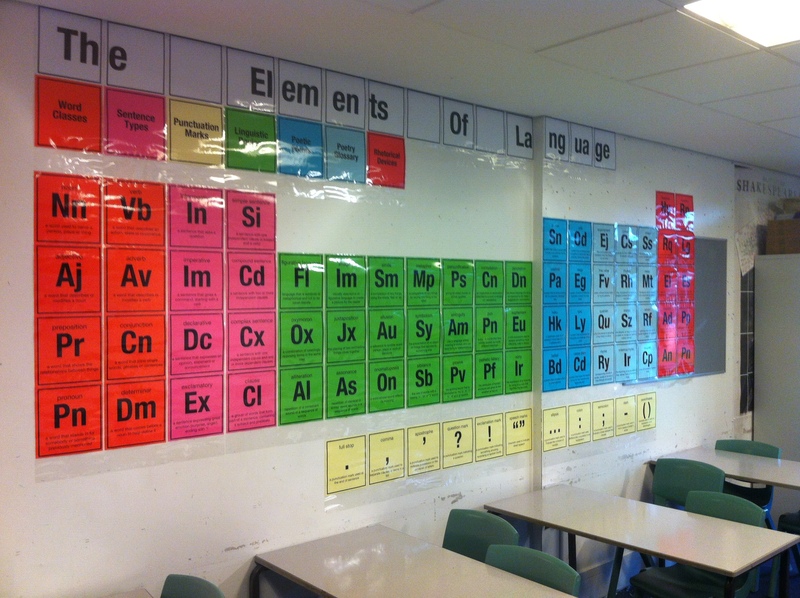 I wanted to ensure that my displays didn’t replace knowing for the pupils (and that it also didn’t replace teaching for me). So, I looked at a way of reducing all of the information I’d previously been giving them to mere cues that could help them access the information from memory and this is where I am now: the periodic table of English. The codifying of terms will hopefully not only serve as memory cues, but also be useful as shorthand for annotation. It’s currently a work in progress, and if I find its use is limited I will go back to the drawing board. One of the areas that I am concerned about is the information on each element: this will be revisited as I begin to gauge its use – whether it is to reduce the amount of information or just the visibility of it. Interestingly, I tweeted a picture of this a few weeks ago and the response was one of aesthetics. I wanted to post this brief précis of how I’m using it because it has its basis in something other than just aesthetics: it is a project on learning, memory and memory cues. Many people have been asking for the files, so here is a link to them. I would add a caveat that, as these are the elements that I teach my classes, you should adapt them for the things that you use with yours and not just rely on these as standard elements. This was originally published on 14th June 2013 on a now defunct blog. Okay, confession time: I can’t stand those ‘why I teach’-type posts. I find them a bit self-indulgent, if I’m honest, and I am far more interested in what we teach and how we teach. With that in mind, this post isn’t an attempt to talk about myself. It is merely an anecdote of my schooling which serves as the reason I think that the new GCSE proposals in English have a lot that is good and right about them. I attended a normal comprehensive school in the late 1980s and early 1990s (I know, I look way too young, right? Right? Ah, forget it…) I spent most of my time back then listening to The Stone Roses and writing bad song lyrics in the back of my French book. School, largely, passed me by. I was quiet and quite introverted, but got on well enough with pretty much everyone in the year group. I was allowed to drift through without being pushed to succeed. And I was rubbish at a lot of subjects. In fact, I was in the bottom set for English when I started my GCSEs. The head of English knocked on the door and said that a few people from the class were going to have to move from this class to the top set. The top set wasn’t very full and this bottom set class was bursting at the seams. They asked for volunteers. 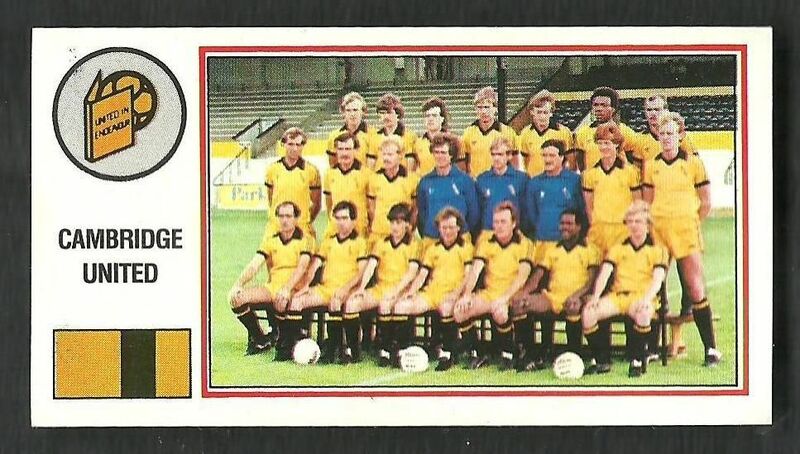 I turned to a mate who was sat in my row: he nodded at me and we put our hands up. I think about 4 or 5 of us went. I don’t know if anyone else volunteered, but we were pointed at, asked to grab our stuff and we left the lads to whatever it is those lads did for the next two years. We were going to the top set. The top set was lovely. They were calm and they were good listeners. We settled in quite well, and I seem to remember that, as this was a group of high fliers, they had taken an extra GCSE option which meant that they had 1 less English lesson than we did. 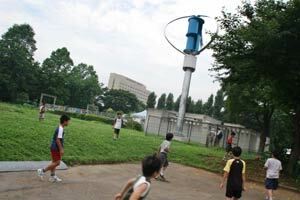 That meant that the 4 or 5 of us got an entire English lesson every week with just us and the teacher. I don’t really remember much about the content of lessons. I remember the teacher talking to the pupils like peers, discussing things intelligently. But what I really remember is the reading. We read texts from cover to cover. And we read lots. We read ‘To Kill a Mockingbird’; we read ‘Macbeth’ and ‘Romeo and Juliet’; we read ‘The Mayor of Casterbridge’. And we talked about what we were reading. And something happened to me: I found out I loved reading. I didn’t always understand everything that I was reading (I was lower ability) and I didn’t always enjoy the texts that I was reading. But I enjoyed learning from them. I enjoyed learning about them. I enjoyed talking about them. And I learned lots. I can remember really disliking Hardy at the time, but I also can recall learning all about fate and determinism and how interesting it was. And, although I may not have valued it at the time, the value I place on reading that book now is immense. It was an introduction to critical theory, although I didn’t know it at the time. Years later, at university, it was this formative experience that allowed me to flourish in reading texts within a critical context. I can also remember at the end of term – midway through Year 11 – seeing the English teachers throwing some old books in the big bins and wheeling them out to the caretaker’s bay. I went to those bins at breaktime and pulled out tattered old copies of the books I’d read, and others too. I still have them now. Reading Thomas Hardy and Shakespeare made me. It made me go out and read more Shakespeare. And from there I discovered other books to read. And I read and read from that point onwards. I’m not from a family that placed any emphasis on higher education. I was encouraged to go out to work after finishing A levels (which was further in education than my older brother and sister ever got – they left school after GCSEs/O Levels). And go out to work is what I did. But all the while I was working, I was also reading a huge wealth of literature for pleasure. And then, in my late 20s, I decided to go to university. And I worked 4 days a week whilst also studying full time for my degree. It was a bit unfashionable to do so, but I read everything they put on my reading lists. The bottom set pupil. Who hated reading. The one single thing that got me where I am today, is the cultural capital I was endowed with in being made to read Hardy and Shakespeare from cover to cover. So, please don’t tell me it is elitist to teach pupils great works of 19th century literature. It’s elitist NOT to teach these texts to everyone. It’s elitist to leave these to the top set pupils or those pupils whose parents buy them an expensive education. Now, I will concede that perhaps the curriculum may be too narrow in only focusing on 19th century novels, and I can understand an argument that it assumes that all great literature was written before 1900. But how is that different to the current curriculum? The current AQA GCSE Literature exam revolves around a similarly narrow field of ‘modern’ set texts. There’s nothing from before 1937 on there. I don’t hear many complaints about that. For me, the proposals offer pupils a challenge. A challenge similar to the ones that I got at school. As David Didau says, learning should be difficult, not easy. I, for one, am looking forward to the challenge. I may not enjoy it, at times. The pupils may not enjoy it, at times. But I am certain that the cultural capital they will gain from studying such texts is worth it.